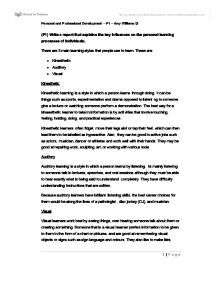 (P1) Write a report that explains the key influences on the personal learning processes of individuals. Kinesthetic learning is a style in which a person learns through doing. It can be things such as sports, experimentation and drama opposed to listening to someone give a lecture or watching someone perform a demonstration. The best way for a kinaesthetic learner to take in information is by activities that involve touching, feeling, holding, doing, and practical experiences. Kinesthetic learners often fidget, move their legs alot or tap their feet, which can then lead them to be labelled as hyperactive. Also, they can be good in active jobs such as actors, musician, dancer or athletes and work well with their hands. They may be good at repairing work, sculpting, art, or working with various tools. Auditory learning is a style in which a person learns by listening. Its mainly listening to someone talk in lectures, speeches, and oral sessions although they must be able to hear exactly what is being said to understand completely. They have difficulty understanding instructions that are written. Because auditory learners have brilliant listening skills, the best career choices for them would be along the lines of a pathologist, disc jockey (DJ), and musician. Visual learners work best by seeing things, over hearing someone talk about them or creating something. Someone that is a visual learner prefers information to be given to them in the form of a chart or pictures, and are good at remembering visual objects or signs such as sign language and colours. They also like to make lists, outline the important parts of documents heavily to catch the eye and can also draw and read maps very well. Visual learners would excel best in jobs such as architects, engineers, and surgeons, and any jobs that have a good view for the future. Concrete Experience is the stage where you participate in the action. Reflective Observation is when you reflect over what you have done or seen in the last stage. Abstract Conceptualization is when you conclude what you have reflected upon, putting your thoughts and experiences into an order. Environment – If the environment is noisy, people can find it harder to concentrate, making it difficult to complete Kolb’s Learning Cycle, struggling mostly on the reflective observation stage as they wouldn’t be able to concentrate enough to reflect. Learning disability such as Down’s Syndrome – When a person has down’s syndrome they find it hard to think abstractly, causing problems for them when on the abstract conceptualization stage, making them unable to conclude what they have learnt and forgetting new information. Peers - Peers can affect each other’s learning according to Honey and Mumford’s learning styles. 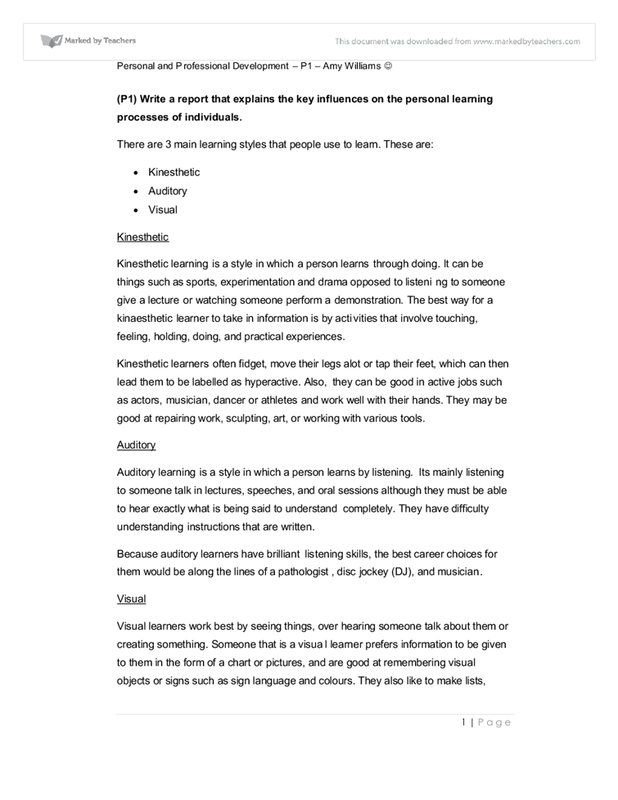 An example of this is if a Activist and a Reflector where paired together to do a piece of work, their learning styles would clash together and the reflector would find it hard to communicate their ideas across. Motivation – Whether or not a person is motivated to do something matters extremely and can determine if they do the concrete experience action or not. Having no motivation to do something makes it difficult to go ahead and do it anyway, making it impossible to complete the learning cycle. 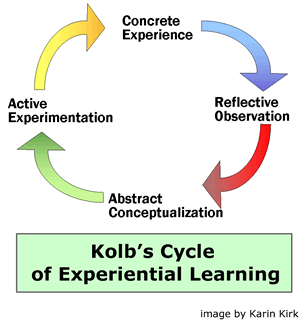 Time – Kolb’s cycle can be time consuming, and not having enough time to complete the cycle can make it difficult for a person to learn from experience. Personal learning and development does not just involve self-help, it includes formal and informal way, teachers, guides, counsellors, managers, life coach or mentors. Personal development is helped with methods, programs, tools, techniques, and assessment systems that support human development depending on the individual. Unit 5-Fundamentals of anatomy and physiology 6. Unit 8-Psychological perspectives. Unit 1 explains how effective communication and interpersonal interactions can be used within the health sector and the factors that influence communication and interpersonal interactions. This unit also gives details on how patients/service users may be assisted by effective communication. Kolb identified two pairs of opposing factors which, combined together, show learning as a cycle with four different stages of learning. Each stage can be entered at any time but for learning to be effective the stages must be followed in a sequence. Children are also able to go to quiet areas through out the day if they want to rest or be in the company of an adult. . E4 (3-5 YEARS OF AGE) Children in this age group come under The Early Years Curriculum and is based upon the early learning goals. Time management can be a high factor on the influence of learning. A pupil having a job, child, and full-time or part-time education would have a hard time using their time in a manageable way. Time management can prevent school work from be handed in late, tiredness, illness, negative emotions, poor grades and lack of understanding. The subcutaneous layer is the later of fatty tissue underneath the skin. This is made up of mostly fast and this helps your body to stay warm and absorb shocks, like if you bang into something or fall down. It also helps hold your skin to all the tissues underneath it.